Content is now a mainstay of marketing. Why? Because people have tuned out from paid advertising. We’re all hit by thousands of ads, over a hundred emails, and countless clickbait every day. We’ve learned from a young age not to trust traditional advertisements and marketing; product-centric content bores us. Today, we want to be entertained and informed by advertising; we prefer real conversations. It’s trivially easy to do our own product research before we make a purchasing decision, and we expect authenticity and integrity from companies before we’ll trust anyone with our credit card information. This makes traditional, product-centric marketing less relevant every year. So we have a vibrant, fast growing industry—and the accompanying demand for more talent. 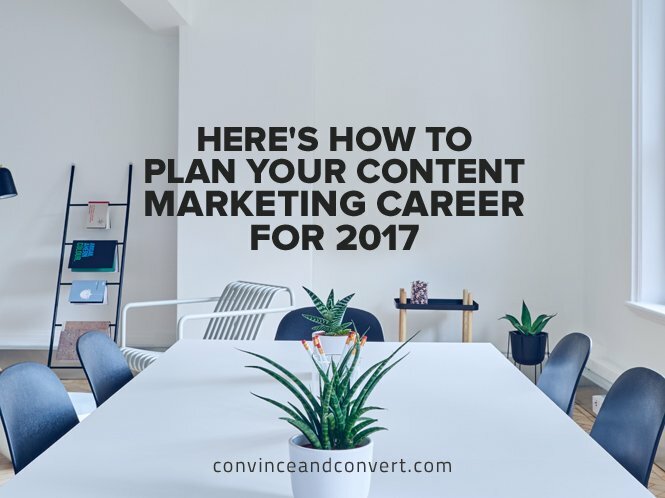 If you’re looking to begin or extend a career in marketing, content marketing is the place to be. What does it take to succeed in content marketing? Curata teamed up with LinkedIn and pooled our data to answer this question. Here’s what we found. The research shows investment in content marketing is increasing, more content is being produced, and more staff are being hired to produce this content. According to Curata survey data, 75 percent of companies are either “increasing” or “significantly increasing” their investment in content marketing over the coming year because of its proven efficacy in driving leads and revenue. To produce this content, 43 percent of respondents say they are increasing staff levels, and there were 19,156 content marketing jobs available on LinkedIn in the fall of 2016. To put this in perspective, that’s 2.8 times the number of jobs in product marketing, 5.5 times the number of brand marketing job openings, and 9.4 times the demand generation jobs listed on LinkedIn. People with “content marketing” in their titles on LinkedIn have more than tripled since 2001. 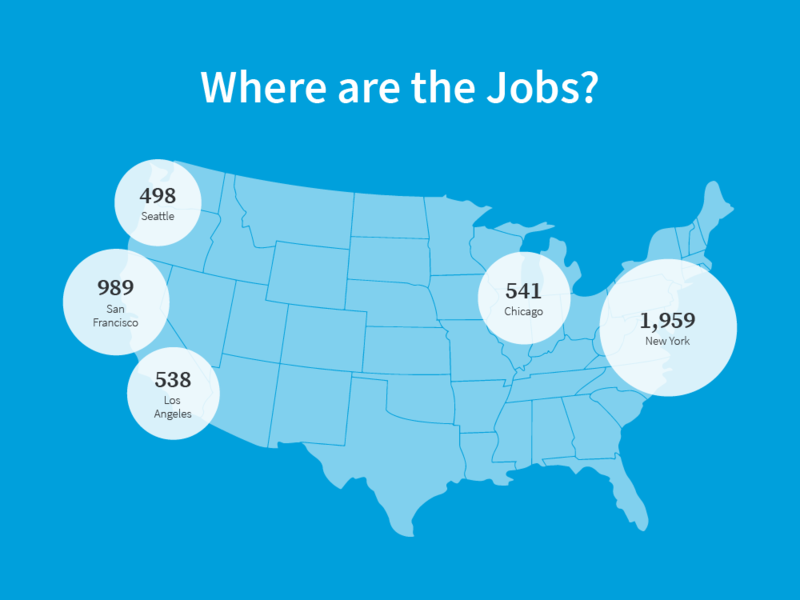 Where Are the Best Job Opportunities for Content Marketers? According to LinkedIn data, five major cities supply the lion’s share of content marketing jobs in the USA: New York, San Francisco, Chicago, Los Angeles, and Seattle. The technology sector dominates the demand for content marketing talent. Hardware, software, IT services, and telecommunications comprise over 33 percent of all respondents. Then there are marketing agencies (19.9 percent), professional services (15 percent), education (13.2 percent), and healthcare (12.9 percent). These industries offer your best bet for a career in content marketing. It’s still a nascent industry in some regards. In terms of seniority, over 80 percent of all content marketing openings on LinkedIn are mid-senior (40.5 percent) or entry level (39.7 percent) positions. 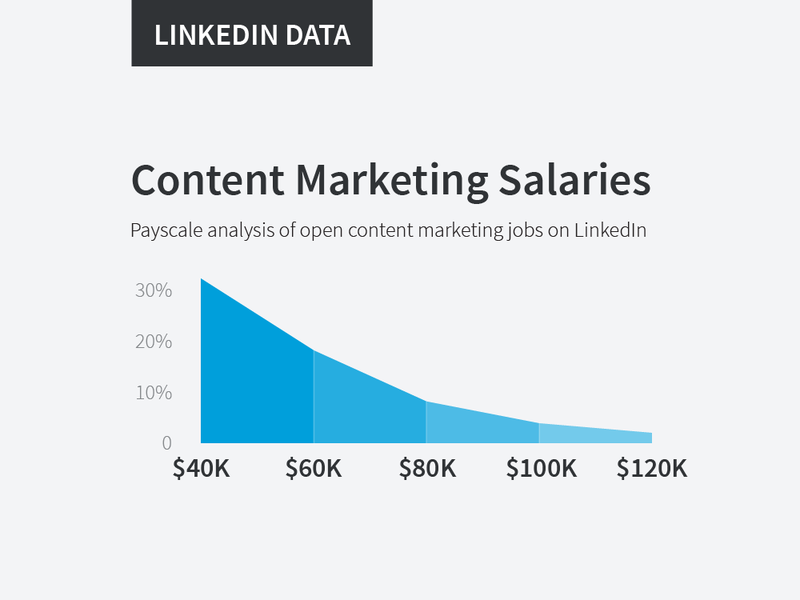 This is reflected in the salaries for content marketing jobs on LinkedIn, with the majority under $80,000 p.a. What Does It Take to Succeed in Content Marketing? Content marketers need a number of skills, but great writing ability is the most crucial. Design and content strategy are also in demand, however. What’s interesting is the relation between content marketing and social media. 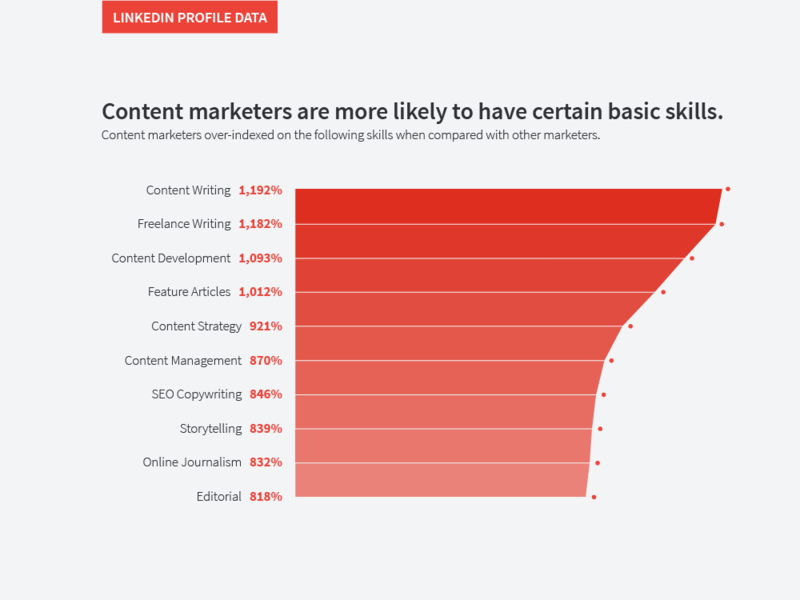 Content marketing is among the top five skills that recruiters search for on LinkedIn. The other four are Instagram, HootSuite, Tumblr, and Pinterest. Content marketing and social media marketing appear to have a symbiotic relationship. 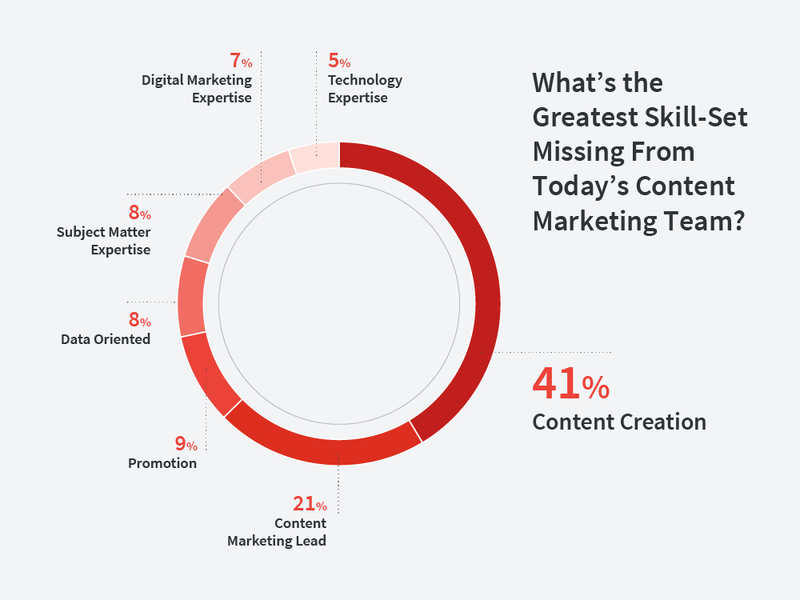 The top skill-set today’s marketing departments currently lack is, by far, content creation. In particular, companies growing their teams are looking for writing, editing, and copywriting skills. They’re looking for creative people who can produce engaging, in-depth content, backed by research and data. As the sector matures, there’s increasing demand for more senior hires to set and execute strategy, with Chief Content Officer, VP, and Director of Content growing in demand. In the coming year, more companies expect to have an executive in charge of their content marketing team, growing from 42 percent to 51 percent. For those looking to land a senior role, avoid midmarket companies. You’ll have a better chance targeting small companies and startups with less than $10 million in revenue, and large, billion dollar revenue companies. These two categories expect to see a 30 percent increase in staffing for the lead role in 2017. Is Content Creation a Career Path for Journalists? Historically, most content has been produced by marketers themselves. The problem is that people trained in marketing aren’t necessarily great storytellers. They’re trained to sell features, but creating engaging, well-edited content is a different skill. Write high-quality, original content for owned media such as websites and blogs, earned media as guest posters, and paid media. Effectively conduct research and surveys to create better, data-backed content. Tap into the best content from around the web using curation. That’s where journalists come in, i.e., editors, editorial writers, and columnists. A good journalist is a skilled researcher and interviewer, can tell a story in a variety of mediums, has fluent diction, is an optimistic skeptic, and constructs persuasive arguments—just the skills content marketers need. Given the demand for journalists’ skills in content marketing (and the higher salaries in a more secure industry), one of the likely trends that will define the following year is a transition of talent from journalism to content marketing. This should mean a significant upgrade in marketers’ storytelling and engagement thanks to better writing and storytelling. These insights about the state of the content marketing sector and content marketing career trajectories are the result of combining and analyzing Curata data from a targeted survey of more than 1,000 marketers based predominantly in the USA, along with data from LinkedIn’s 146 million North American profiles. The associated ebook, The Ultimate Guide to a Content Marketing Career, includes observations from content marketing experts Ann Handley (the Chief Content Officer of MarketingProfs), Joe Pulizzi (Founder of the Content Marketing Institute), and Joe Chernov (Vice President of Marketing at InsightSquared). You can download it here. Mitchell Hall is Curata's Content Marketing Director. Online since 1991, he has been writing for magazines and newspapers since 1997, and editing and managing websites since 2006. Mitchell has a BA in Political Science, Philosophy, and English. A generalist, his most covered topics are business and technology.